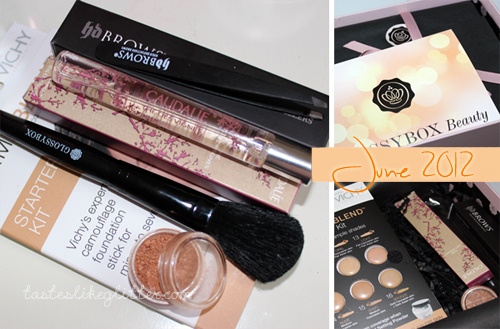 This months Glossybox arrived whilst I was away but it was popped in the green bin for me. I know a lot of people have had problems with the courier service they're now using but I've never had any problems with my Hermes delivery lady. I've only had one HD Brows product in the past, the brow palette. That was in the first box I received. I've been a user of a neon pink pair of Tweezerman tweezers so it'll be interesting to see how these fair up. Though at present I'm not allowed to touch my brows as I'm growing them back for a HD Brow treatment! Eaux Fraices Thé Des Vignes, Google tells me translates to 'tea of the vines fresh water'. A little bit of this goes a long way, I'm currently sitting with just a single spritz of my wrist and it's really fragrant. Sorry for the want of a better word but it really is a fresh smelling Summery scent, like nothing I own at all. It contains white musk, neroli, ginger, orange blossom and jasmine. It's wonderfully sweet but not overpowering. I'm really lemming the full size which isn't a bad price at all. This a natural goat hair blush brush that is said to give soft makeup application. Honestly I'm not a fan, this isn't the softest of brushes I own and it sheds like a good'un. I thought my MAC 109 was bad but this is something else. This isn't available to buy separately but it will do for a quick sweep of blush but not something I'd use on a permanent basis. Vichy - Dermablend Ultra Corrective Foundation Cream Stick. I bought the Dermablend liquid foundation last week and Nic from Pixiwoo used this in a recent video and said it made a brilliant concealer. I was tempted to pick this up too but I'm glad I didn't now. Especially as I was dithering on which shade to pick. I've not used or opened it yet but when I do, I will be sure to let you know. If it's anything like the liquid, it will be brilliant. I own one bronzer and I've used it once, they honestly scare me. Whilst I'd prefer this with a sifter top lid, with the tiniest amount this is such a nice glowy bronzer that really brings a lot of warmth to the face. Perfect for the sunny days. I can see this lasting me quite some time because of the lack of good weather and because you really do only need the smallest amount. Overall a really good box and I will be using every single product for a change.